Sunday Quote!- Charismata and Authority of Scripture | J.W. Wartick -"Always Have a Reason"
Now I have not finished the book, so I’m not sure whether Ruthven would affirm this point. Indeed, he calls this a “polemical” argument against spiritual gifts, so I suspect he’s going to argue that the “continuationist” position–that which affirms spiritual gifts moving into the modern era–does not need to deny the closedness of the canon or affirm a denial of the sufficiency of Scripture. I’m looking forward to seeing how his argument proceeds, and whether he will indeed argue against this or affirm the openness of the canon. What do you think? Do charismata–spiritual gifts–entail this position? If so, how problematic is it? What is your position? I’d love to read your thoughts in the comments. “Are Miraculous Gifts for Today?”- A look at four views in Christian Theology– I provide a look at four positions on miraculous/spiritual gifts in contemporary theology. 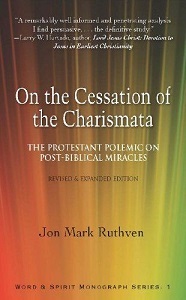 Jon Mark Ruthven, On the Cessation of the Charismata (Tulsa, OK: Word & Spirit Press, 2011). « Really Recommended Posts 1/16/15- Abortion, Jesus, Science Fiction, and More! Some try to make I. Cor. 13 out to be the foundational passage for cessationism. I believe that this is a forced reading. Macarthur makes much out of a Greek term which he finds to be substantive in terms of reading “glossolalia” as one of those temporal gifts which would have ceased at the closing of the canon. Where the closing of the canon is specifically referenced in I. Cor. 13 is a bit tougher to pin down in my view. I was actually pleasantly surprised when reading Warfield’s argument for cessationism that he noted a significant concession toward continuationism: the key, core chapters in I. Cor. (12-14) were *not* descriptions of a unique body of Christ manifestation. That is, Warfield was willing (if I read him correctly) to acknowledge that the Corinthian church did not singularly understand spiritual gifts and their manifestation, particularly in the exercise of tongues (glossolalia). Other church bodies from other locations would have grasped and practiced spiritual gifts. While this doesn’t touch the argument from I. Cor. 13 against continuing spiritual gifts (which I find to be rather implausible a la Macarthur’s strained exegesis), it is an important linchpin in the continuationist position from the New Testament. Personally, I believe that the exercise of spiritual gifts is, in fact, ongoing. Their practice ought to be critiqued and discerned, of course. Keener is pretty solid on charismata and biblical exegesis supporting it. I used this book as a source in a paper I write for my Theology class last year. Lots of good stuff to chew on. Actually, the book argues that spiritual gifts continue in the church BECAUSE THE NEW TESTAMENT SAYS SO !! Look at the generalizations–the universal claims– in Rom 11:29 (“the charismata and calling of God are NOT WITHDRAWN”). “Charismata” here cannot be twisted into the so-called “ordinary” gifts that continue, like hospitality and administrations. The 8 other contexts where “charismata” appear in the NT refer directly to healings or prophecy. 6 and there are varieties of empowerments, but it is the same God who empowers them ALL in EVERYONE. 11 ALL THESE [charismata] are empowered [continuous present] by one and the same Spirit, who apportions [continuous present] to EACH ONE individually as he wills. Thank you for stopping by, Dr. Ruthven. I agree with the thrust of your argument in this book, but I do still wonder about what the exact response would be to the “openness of the canon” argument. It seems to me that one could just argue that just as other prophecies in the NT and OT were not recorded as Scripture, so to current prophecies are not to be canonized. Sorry for taking so long to respond, I hope you’ll receive this response! The way it was explained to me was 1 Cor. 13:10, “10 But when that which is perfect has come, then that which is in part will be done away.” “That which is perfect” is said to be the canon, then gifts would cease. I disagree with that interpretation, and believe it to be some aspect of Christ’s second coming. I imagine it is when we are in Heaven, and we see the marriage of the perfect lamb. What clinches it for me is the flowing gifts in my own life, and the lives of certain Christians around me. After a while, seeing the success of putting faith in God overwhelms my mind’s ability to argue “coincidence.” From what I can see, if gifts have ceased, then someone should tell God. Thanks for your response and sorry I took so long getting back to you, but I think you’re right in regards to 1 Cor 13:10. I also think that seeing the Spirit’s work in our own lives is a powerful argument, and one which can and often should get past our all-too-often overly skeptical minds. We shouldn’t be totally gullible, but neither should we be quick to dismiss any possible spiritual activity.